According to reports, during the recent party meeting, a section of leaders from Bengaluru proposed the idea of the JD(S) supremo contesting from Bangalore North. BENGALURU: Union Minister D V Sadananda Gowda Sunday said former Prime Minister H D Deve Gowda was 'most welcome' to contest from his Bangalore North parliamentary constituency in the coming Lok Sabha polls, as he expressed confidence that he would succeed if given an opportunity. "Most welcome. Till now I was contesting against small people. I entered parliament for the first time after defeating Veerappa Moily (former union minister)," Gowda said in response to a question from reporters about Gowda contesting from Bangalore North constituency. I wish to contest against Deve Gowda once. If God gives me an opportunity I will contest and will succeed." Sadananda Gowda is the sitting Member of Parliament from Bangalore North. 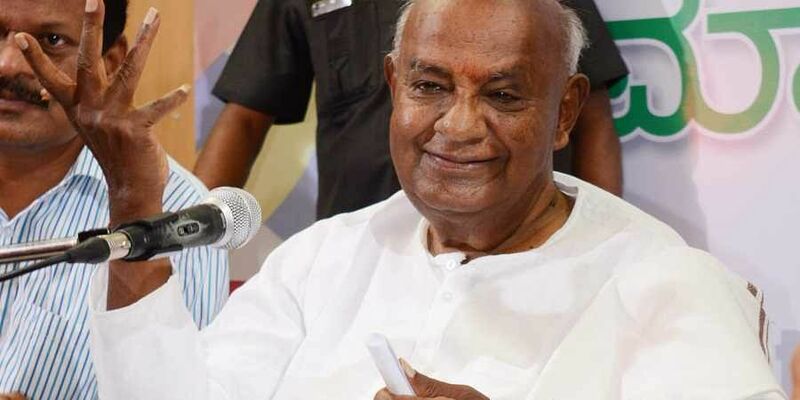 Meanwhile, Deve Gowda, in response to a question on whether he would contest from that constituency, Sunday said, "why (discuss about it) now itself." The former Prime Minister had in March said he would not be contesting the 2019 Lok Sabha polls. However, recent reports have suggested that pressure is mounting on him to contest from Bengaluru North or Mandya constituencies. According to reports, during the recent party meeting, a section of leaders from Bengaluru proposed the idea of the JD(S) supremo contesting from Bangalore North as it would help the ruling coalition gain hold in the city. Vokkaligas, the community to which Gowda belongs, have a considerable presence in the constituency, along with minorities. Currently, BJP has its hold over the three Lok Sabha constituencies Bangalore- North, South and Central. Noting that the ruling Congress-JD(S) coalition are yet to discuss seat sharing, Deve Gowda said his earlier comments of his grandson Prajwal Revanna contesting from Hassan was his personal wish and the party was yet to decide on it. "Has Congress and JD(S) decided on any seat till now? None. On Hassan you in the media have discussed several times, so I had said why do you worry, I will make my grandson (Prajwal) contest," the JD(S) supremo said. "This is my personal statement. Our partys parliamentary board has not yet decided. I have expressed my personal feeling in front of you," he added. Gowda had recently given a clear indication about his grandson Prajwal Revanna contesting the LS polls from Hassan, the JD(S) bastion that he has been representing. Prajwal is the son of Gowda's elder son and senior JD(S) leader, PWD Minister HD Revanna. Prajwal's candidature will mark the entry of the third generation of Gowda family into electoral politics; with both his father and uncle- Chief Minister H D Kumaraswamy already at the helm of states political affairs. There are also reports that a section within the party was pushing Kumaraswamy's son and Prajwals cousin- Nikhil Kumaraswamy's candidature from Mandya if Deve Gowda chooses not to contest from there. The ruling Congress-JD(S) coalition in Karnataka will take a decision on seat sharing for the coming Lok Sabha elections in three or four days, coalition coordination committee chairman Siddaramaiah had said Thursday. JD(S) has already expressed its desire to contest in 12 seats, on which the Congress party has some reservations. The Congress has said seat sharing would be on the basis of 'merit'. Seat sharing is expected to be a litmus test for both parties, mostly in old Mysuru region constituencies, where JD(S) has emerged as a dominant force in the recent past and Congress has its sitting MPs.